The world’s biggest MMA organization has announced a bantamweight brawl between Mike Easton and Ken Stone will mark the fourth and final fight to air live during the Octagon’s debut on FX. 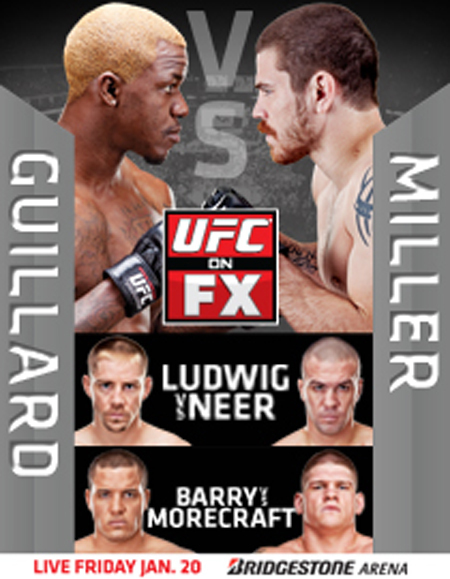 “UFC on FX: Guillard vs. Miller” takes place January 20th inside the Bridgestone Arena in Nashville, Tennessee. Ten scraps have been confirmed for the show thus far. Lightweights Melvin Guillard and Jim Miller headline the festivities. The 155-pounders will battle in a pivotal three-round affair. FUEL TV broadcasts all of the night’s preliminary action live beginning at 6PM ET/3PM PT. FX will air the main card immediately after starting at 9PM ET/6PM PT.